The style of the buildings definitely looks more like Lakes than Scotland. The hill reminds me a bit of Harter Fell (the Eskdale/Duddon one) or the nearby Caw, but I can't do any better than that. This type of painting often involves a big chunk of artistic licence! That's rather nice and well executed in watercolour. Has a bit of the look of the elder Heaton Cooper about it. 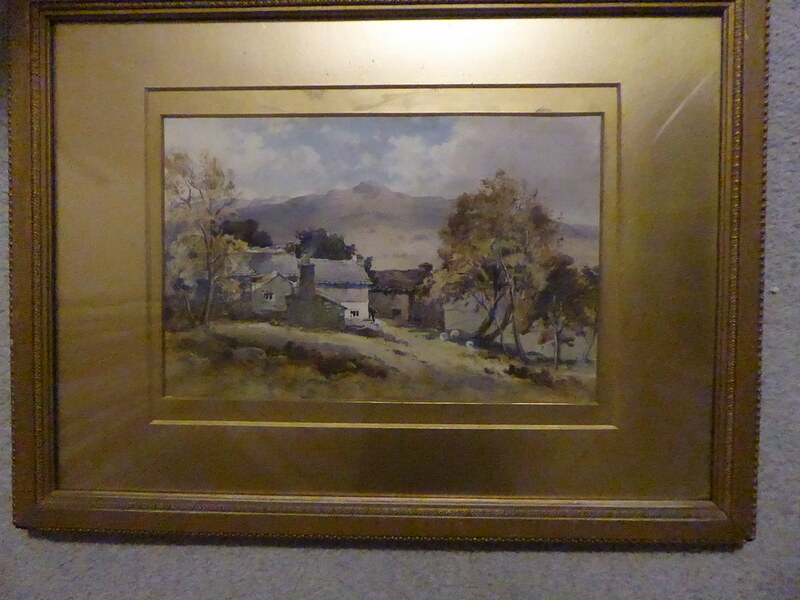 Is it an original or a print, and is there a signature. I'm going to hazard a guess it's in Little Langdale looking towards Lingmoor Fell with Side Pike on the left. The Langdale Pikes would be peeping out on the left skyline if I'm right. I'm a buyer if you're a seller btw. Certainly has a Lakeland feel about the fells and the buildings. If CT's suggestion turns out to be right, hats off! Some seriously good detective work! reminds me of the hills east of Keswick but can't place it. We are going back to the Lakes in March, and as R hurt his back* last time we went, there may be opportunities for driving around the places suggested , though from my recollection of the Lakes, it is very hard to stop anywhere. We will have to stick a camera out of the window. He is convinced he will be better by then...we will see. * Not from climbing, or even hill walking, just from getting out of the car in ordinary shoes to take a photo.